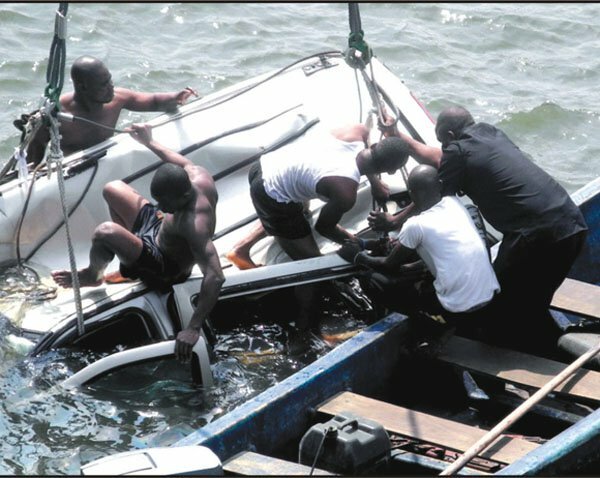 A retired Air Vice Marshal (AVM) and his driver have recovered dead after their Ford Explorer Sports Utility Vehicle (SUV) plunged into the lagoon Saturday night. The incident occurred around 10:55pm, by the University of Lagos (UNILAG) waterfront. A motorist had told The Nation that: “There was a vehicle inside the lagoon. People are trapped in it. The vehicle was heading into Lagos Island. The deceased were said to be driving inward Lagos Island, when they colluded with another vehicle on the bridge. As a result of the accident, the SUV, it was gathered, tumbled several times before skidding into the lagoon. It was learnt that officials of the Lagos State Emergency Management Agency (LASEMA) and local fishermen recovered the bodies from the submerged vehicle around 2:30am. According to a source, they both had their seat belts on and didn’t have physical injuries. He said: “All the air bags in the vehicle came out. It was a serious accident. The burnet pulled out and the roof was flattened, which indicated that the vehicle might have tumbled at least three times before nosediving. “The vehicle was over 75 percent submerged into the muddy part of the lagoon. When we brought it out, we had to first raise the flattened vehicle to avoid inflicting injuries on the bodies. A prominent Lagosian, the AVM, it was gathered retired from the Nigerian Air Force some years ago and had since devoted his time, resources in the real estate sector. It was learnt that the retired General came into Nigeria last Tuesday from the United Kingdom to attend a burial. General Manager LASEMA, Adesina Tiamiyu confirmed the incident, but declined further comments on the issue.